Miso Crafty Knits: Happy Canada Day! Yes, I'm being lazy and recycling last year's Canada Day photo. But hey, I'm on the road and don't have access to my main computer to upload the photos on my camera. So this will have to suffice for this year. 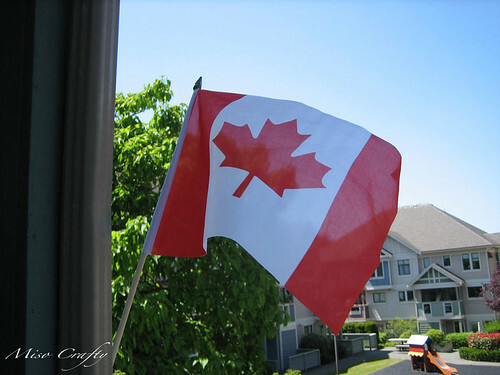 I hope everyone is enjoying their Canada Day and are out and about having BBQs, beers, and a run through a park! At least that's what we're doing here in Nelson! With that said, I'm going to suss out some more watermelon, some bubbles (the kidlets can't get enough of the bubbles!! ), and enjoy some quality time with my family. Hope you're doing the same.